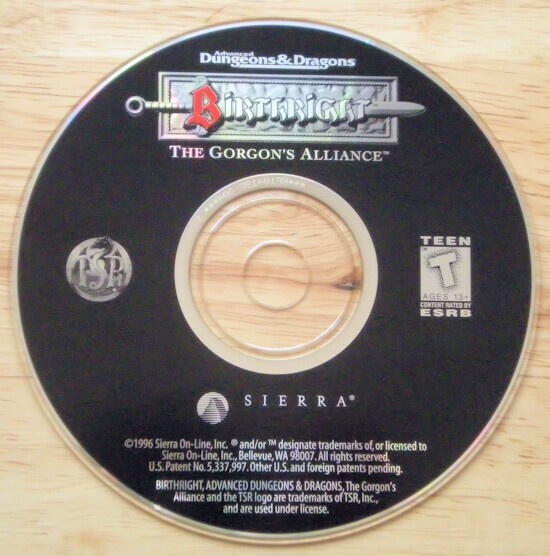 Birthright: The Gorgon's Alliance is a strategy game with an RPG twist, using the second edition rules of Advanced Dungeons & Dragons as its foundation and providing many rewarding hours of gameplay in the process. You assume the role of regent of one of the realms of Anuire. The object is to earn enough regency points to accede to the Iron Throne before any of your opponents. The final opponent, the Gorgon spoken of in the title, assembles an evil horde by the end of the game making this task quite difficult. You earn regency points by forming relations with or subjugating your neighbors. Once you earn a predetermined amount of points, you are given the power to unite the land of Anuire under your flag, restoring the glory at the end of an eon of over-dramatized chaos. Regency points add to the strength of your realm, as do cash, standing army, holdings in other realms, and magic resources. Each turn is divided into three actions, and each action takes one game-month to accomplish - collecting taxes from your subjects, casting ultra-powerful realm spells on your rivals, hiring lieutenants (NPCs) to muster your troops, and conducting diplomacy. Should your regent become restless, you can enhance abilities and realm strength by questing for artifacts in adventure mode. During adventure mode, you and your lieutenants gallivant through statically mapped dungeons, usually slaughtering everything in sight. Adventure mode is true to the D&D system, where each regent's class governs his modes of action. If your mage knows the spell Fireball, he can cast it, but if some of your party is wandering into its area of effect, then say goodbye. There aren't any negative hit point rules: you go to zero hit points, game over. Once alliances and hatreds have been established in each game, there will be a lot of inter-realm skirmishes. You can opt to let the computer run (and usually ruin) your armies. Or you can march onto the field of glory, risking your regent's, lieutenants' and army's lives. 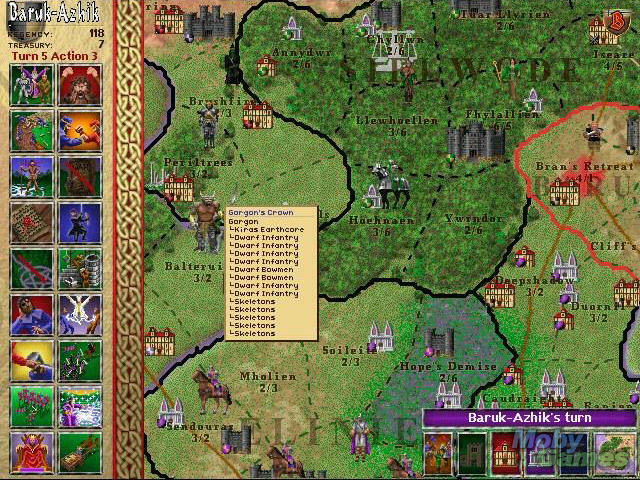 Battles are fought in turns on terrain represented by a 3 x 5 grid. Sometimes the battles are slightly reminiscent of the classic Archon, since you can win a battle by attrition or occupation of a certain area on the board. There are also multiple moves per turn, and racial and terrain bonuses - imagine elves in wooded terrain. The game has several skill levels, and each skill level presents you with more control over your realm. Birthright's strongest point is its playability. There are many ways to arrive at an endgame and there are many different endgames, a tribute to the gaming system's statistical complexity. 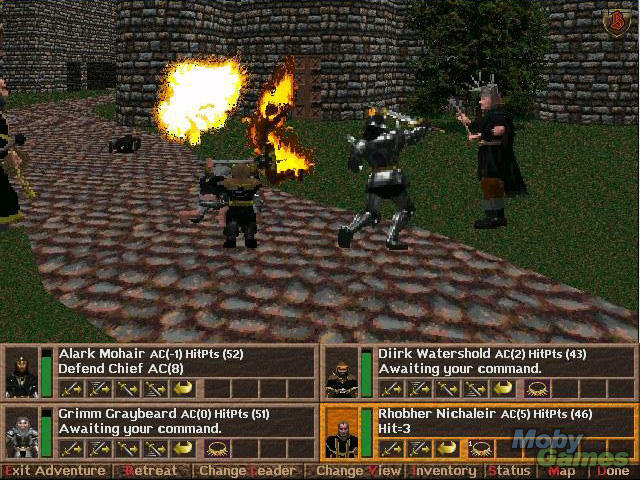 The mixture of first- and third-person activities and the similarity to classic Dungeons and Dragons are to be appreciated.